A few weeks ago I was finishing my first hoodie with raglan sleeves that I hope be able to show you soon. At the same time a reader asked me how to transform a basic sleeve into a raglan one. I took this opportunity to write a tutorial on how to draft a made-to-measure pattern for this type of sleeve. So I took the 2nd volume of draft-pattern books written by Teresa Gilewska (who else?) and I found in a method that seemed quite accessible to me. This is what I want to share with you here. First you need to finish the bust pattern and to build a basic sleeve based on final armhole measures (see the tutorial if necessary). Please note that the raglan sleeve allows great mobility so it is not necessary to move down the underarm line when you add the ease. Not for hoodies. It seems that this type of sleeve was invented for Lord Raglan who was injured at shoulder and needed a large sleeve that slips easily. Today raglan is mainly used in sportswear. Thank you Great British Sewing Bee on BBC for this this historical break and let’s start working (Figure 1). On the back bust pattern, draw the underarm line and the arm-to-arm line. 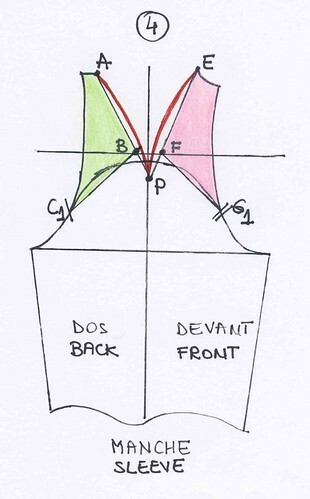 Divide the back neckline by three (actually the half back neck line as we work with semi-patterns). 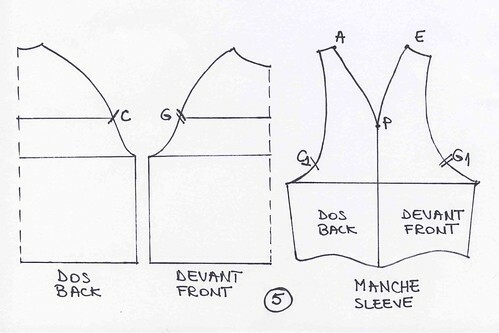 Draw a curved cutting line from the armhole at the arm-to-arm line to the back neckline divided by three. 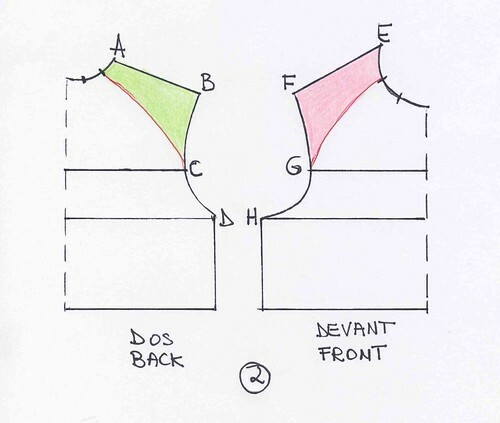 Do the same for the front bust pattern (Figure 2). If you feel ready, cut the two parts of the bust pattern on the cutting line. Otherwise, copy these two shoulder parts onto another sheet. Take the basic sleeve pattern you built upon the armhole measures and draw the underarm line and the vertical middle line. 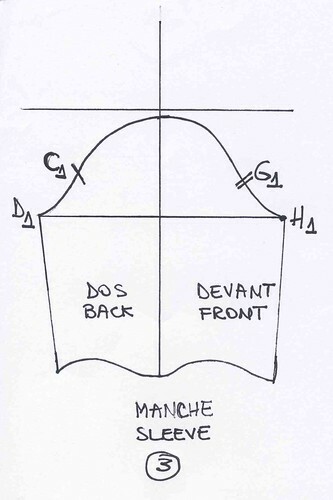 Draw an horizontal line at 1 cm above the top of the sleeve (Figure 3). Take the two cutted parts from the back and front bust and place them on the sleeve starting from the notches. Points C and G should cover C1 and respectivelly G1. Rotate the two cutted parts so the points B and F lie on the horizontal line you drew earlier. Extend the lines AB and EF so they join the middle vertical line in the point P. I confess that, at this stage I was a bit lost, struggling to align AB and EF in the same point. The problem was actually the position of the notches that I have therefore adjusted. Slightly bend AP and PE for a nice shoulder line and ensure that AP = PE (Figure 4). 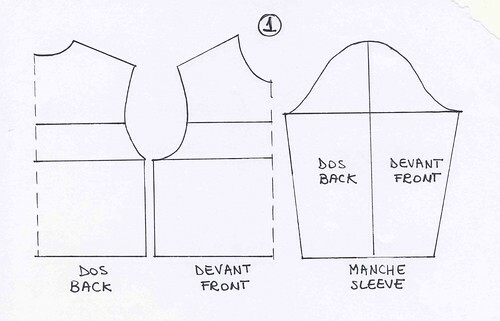 Your bust and sleeve patterns are now completed (Figure 5). Sewing and applying them is really a piece of cake. Does this method seem applicable to you? If you try it, please let me know how it worked, I would like to know if you struggled like me. If you find another way to draft the raglan pattern, also let me know. This is a method that is well suited for woven fabrics. When using knitted fabrics, I noticed that raglan sleeves have no shoulder seam. Do you know how this pattern is built? This entry was posted in Patterns and tagged raglan, sleeve. Hi Ayida, thank you for your comment, it allowed me to fix the error in the nothces formula. Therefore the notchces for the sleeves are 0.5 cm higher than the notches of the bust. I hope you’ll manage to draw it. Would love to see that! I’m drafting a pattern for some fabric that would look great with raglan sleeves without the middle seam. This site is AWESOME! ya i know one method how i can share it with you ? ?